This photo assignment served as my first real experience with historic Native American poverty and living conditions on the poorest, poverty-stricken Indian reservations in North America  G BALLARD photo courtesy of the KUMEYAAY.INFO ARCHIVE. The very next day I was on a full-day job photographing a child's extravagant birthday party (that must have cost $20,000 to put on) at his parents' $22 million home...try to imagine how that affected my personal perspective on Native American poverty and you may better understand my commitment to the Indians. 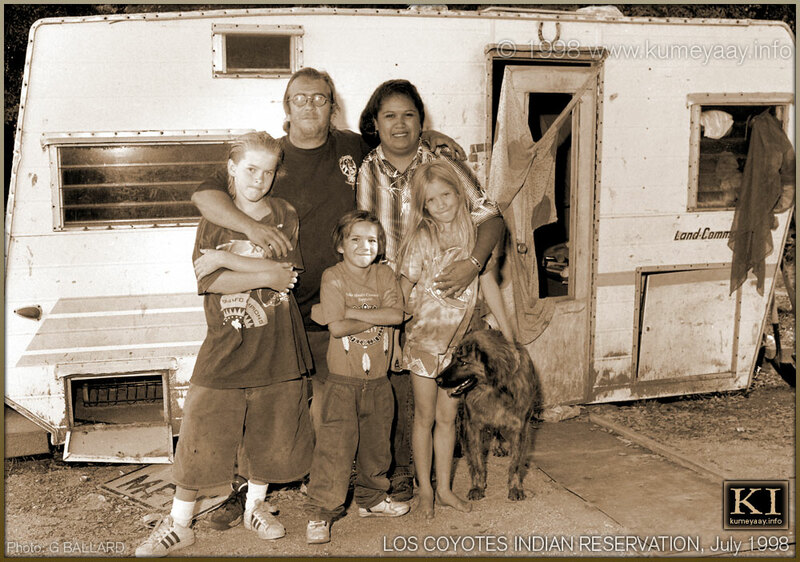 A Cahuilla Native American family poses alongside the 8- by 12-foot travel trailer that they lived in together for the past two years on the Los Coyotes Indian reservation; a federally-recognized Indian reservation located in a remote mountain wilderness area of San Diego County. This Indian home, like too many other Native American homes in North America reservation communities, is without electricity and running water. Just two months earlier, this Cahuilla family was moved into an adjacent new 24- by 46-foot, three-bedroom home (with newly-wired electricity & running water) as part of a program, sponsored by national and California gaming tribes, to aid the nongaming tribes in their historical conditions of Native American poverty. Pictured are Mr. and Mrs. Kupsch, their three children and dog, Burger King. When this Cahuilla family photograph was made in 1998, Francine Kupsch was serving on the Los Coyotes Tribal Council as Secretary. She has since served as Tribal Spokesperson (or tribal Chairperson). I was hired to produce a series of photographs and 30x50-inch display prints for a conference display. Since the 1998 photo was taken, housing for Chauilla-Cupeño Indians has improved on Los Coyotes reservation. 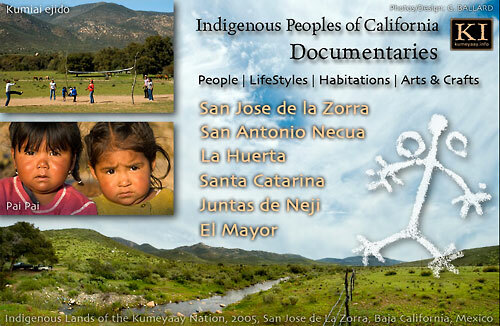 See our original in-depth professional photojournalistic multimedia documentaries on modern California Indian lifestyle, housing, arts, crafts, gatherings, music audio and video clips.